The Museum of Modern Art presented Eiko & Koma's Caravan Project in its front lobby January 16-21. 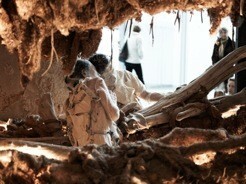 Eiko & Koma performed the work as a new living installation during all hours the museum was open to public. The performances were in conjunction with the exhibition Tokyo 1955–1970: A New Avant-Garde, which runs through February 25. This new version of Caravan Project was made especially for MoMA's lobby. In creating the piece Eiko & Koma thought about the architecture of the lobby space in relation to the flow of audience members into the museum, past the Caravan, and up the stairs to the other exhibitions. The installation and performance were specifically designed to be seen from multiple angles, different distances, and a variety of elevations. Positioned as it was in the lobby of MoMA, Caravan Project was seen by 30,000 people over the 44.5 hours of performance time during the week-long installation. Caravan Project at MoMA was made possible in part by the Doris Duke Performing Artist Awards program.